A new book, "Architecture & Design versus Consumerism: How Design Activism Confronts Growth," explores the "meaning gap" between the potential in architecture and design for social good and the commercialism and consumerism that serve as context for the professions. This article — part of a virtual book tour — focuses on mobilization, one of five methods for design activism explored in the book. Designers concerned with transforming cities for ecological sustainability face the challenge of engaging (or re-engaging) people with urban places. How to signal the need for a more hospitable urban environment? Drawing upon longstanding methods for political activism, design can be applied in concert with mobilization. Mobilization brings together numerous participants for a specific purpose without demanding further involvement. Such efforts are often aimed at showing that a particular issue has salience for a population with collective power by way of voting, purchasing or volunteering. Classic forms of mobilization include marches, boycotts and petition drives. Events such as Earth Day have inspired initiatives like Buy Nothing Day and Bike to Work Day, as well as festival-like events (dubbed "protestivals"). Designers engage in conventional mobilization tactics as well as methods rooted in their unique skill sets. Architecture 2030 organized an emergency "teach-in" aimed at bringing design education into the environmental movement. The global event was webcast in February 2007 to 250,000 design students and educators from 48 countries. 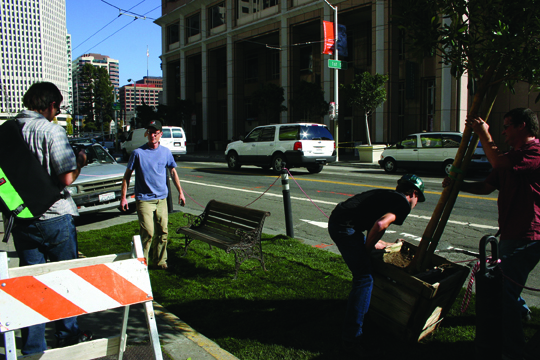 Rebar’s International Park(ing) Day mobilizes widespread urban "hacking" to turn metered parking spaces into micro-parks for a day, drawing attention to the dominance of automobiles and awakening alternative possibilities. The San Francisco chapter of Architects, Designers and Planners for Social Responsibility organized a boycott aimed at the design, construction and renovation of U.S. prisons. Three hundred participants signed on to voice disapproval of the rapidly expanding "prison system’s treatment of inmates, and its inherent racial and social inequalities." Design competitions and awards aimed at social change typically mobilize designers toward addressing global problems. Competitions can help publicize important issues, attract design services and recruit sponsors toward implementing winning projects. Green Ground Zero organized an international design competition to solicit ecologically sensitive development plans for a neighborhood destroyed in the 9/11 terrorist attacks. The aim was to pressure those in charge of redevelopment to make public health and environmental sustainability top priorities. More than anything, I couldn’t stop thinking about the hundreds upon hundreds of proposals, representing countless ideas and thousands of hours of work that go into each competition. So much of this work ends up on storage room shelves or in rarely seen portfolios. Is this the most effective use of our collective time and energy? 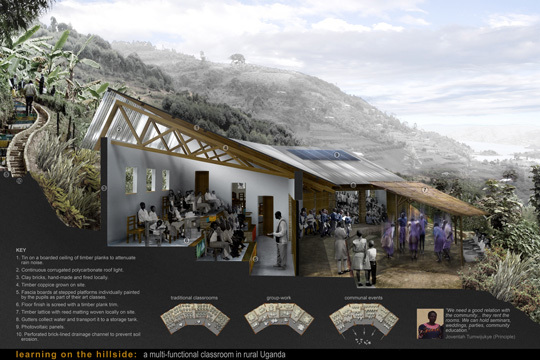 By contrast, T. Luke Young and Alix Ogilvie of Architecture for Humanity argue that, even when competition entries aren't built, their creation leads to change in important ways: First, competitions raise awareness about the spatial dimensions of societal problems, both for the designers who participate and for the people who view their submissions. Second, the process of peer review and the diversity of entries serve to develop a knowledge base about design's potential in a given challenge area, while also highlighting potential tensions or trade-offs in approaches that may not be as apparent in a single design response. Third, a competition’s real results tend to emerge much later. T. Luke Young notes that Architecture for Humanity grew out of a single competition; and anecdotal evidence suggests that, although "social change" competitions don't require long-term engagement, participants often apply the ideas developed in their submissions toward future projects with similar objectives. Competitions sometimes end with exhibitions of winning entries, but exhibitions in themselves offer another way for designers to mobilize large groups of people. The U.K. regional Design of the Time (DOTT) program hosted the Contains exhibition, curated by [re]design, to explore the social and environmental issues surrounding product design and use. 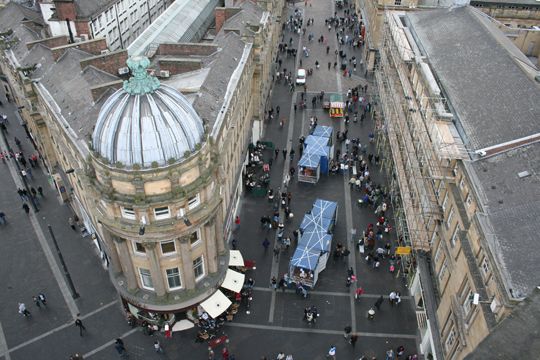 It took place in a series of shipping containers placed around Newcastle’s retail district, where an estimated 40,000 shoppers viewed the exhibit over a 10-day period. One of the most important things about mobilization is its value as a conceptual tool for engaging people and signaling the need for change. It also stretches designers to consider initiatives that lie beyond the boundaries of a single project. In addition, it gives designers a common language to use with other activists. To learn about other design activism methods, pick up a copy of "Architecture & Design versus Consumerism" (Earthscan/Routledge 2012) on Amazon or use the 20-percent discount code BRK96 at Routledge. Follow the tour on Twitter via #DvC12 and at the following stops along the way: Oct. 2 and 4 — Shareable; Oct. 9 — Polis; Oct. 16 and 18 — Green Conduct; Oct. 23 — Transforming Cultures (Worldwatch); Oct. 30 — Post Growth Institute; Nov. 6 — no tour stop so get out and VOTE; Nov. 13 — The Dirt (American Association of Landscape Architects); Nov. 20 — Proto City. Ann Thorpe is a collaborative design strategist and author of "Architecture & Design versus Consumerism." Ann also wrote "The Designer’s Atlas of Sustainability" and serves as strategist for the Seattle-based social enterprise luum. Great idea to examine different forms of activism and how they're applied in combination with design. These methods sound not only feasible but potentially fun. I only wonder if there will ever be a way for designers to not be so dependent on commerce to earn our living. Even promoting this book is a form of commercialism and consumerism, albeit for a truly good cause. If only all forms of commerce were so oriented toward social justice and ecological care. Commerce is the best way we've come up with over the course of history to meet human needs. It's the only thing that seems to work, however imperfectly. Consumerism is out of control, but I don't see a serious alternative to commerce. What would happen in the absence of markets? Would people spontaneously work for the good of society? How would things be organized? This design activism is good but I'm not sure if it can lead to structural change. Maybe it's just something we do to feel better about ourselves and build our resumes. change doesn't have to happen all at once. it's a process, and these kinds of things can set the process in motion. Competitions are a particularly misguided way of bringing quality change to low-income communities around the world. Hundreds of designers, most of whom have never been to the country or city, let alone community, in which the project would be located, come up with ideas that are almost always unrealizable. Good governance should be the objective. It's the most fair way of fostering good design (ie really good, of substance, practical, informed by future inhabitants, not just formally impressive). Like anything else, design implementation requires power. Designers who want to be independent from commerce have to develop an alternative source of power. Thanks for your comments. and thanks to Polis blog for hosting a stop on this virtual tour. on structural change -- one could argue that activism is the only think that ever brings about change, but it never works by itself. For that reason it's important to recognize that design activism is necessary but not sufficient. Chapter 6 in the book looks at questions of power and influence, to m.l.r's point. design can help with solving instead of creating major problems if the power behind it is fully democratic, and if there is a priorities shift from short term individual gain to long term collective gain. i don't know if democracy will bring about that shift, but at least it would stop a small group of people from making decisions that affect everyone. then designers who care about the common good might have more opportunities to realize their ideas. Ellen, an interesting point about how democratic the design process can be..."the power behind it." This brings up the question of who is the client? Can designers afford to choose clients that bring peopel in to the process? Perhaps more important, can designers influence that process no matter who the client? I think the answer is yes, and I address some of the questions of influence in chapters 5 and 6. Sometimes it may come down to proposing alternative processes when opportnities arise.